Three other sailboats anchored near us last night and left before it was light. We passed each one by 1000. Our course took us past the Kennedy Space Center where we could see the rocket assembly building from 25 miles away. There were no lift offs today unfortunately. Poorly named Mosquito Lagoon is a long, very wide and beautiful stretch of water. It is wild on all sides and reminded us of Kentucky Lake. 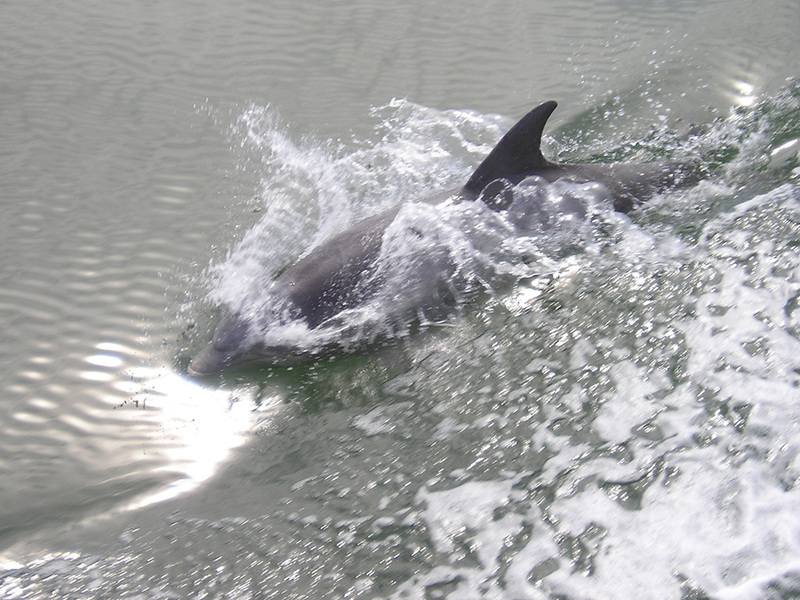 Unlike Kentucky Lake we had dolphins accompany us several times. The tidal current in the Halifax River was running against us at about 2 mph. and slowed us down. At one point Mavis and I debated whether you can resume speed when you see the resume sign or whether you have to wait till you get to the sign. I decided that it was OK to speed up insight of the sign. A boat coming our way turned on its blue lights. It was the sheriff. He set us straight but did not issue a ticket. Now we know. We finally arrived at Halifax Harbor Marina in Daytona at 530 just before closure. A new restaurant had just opened up in the marina and we decided to try it. The service was abysmal but the food when it finally arrived was pretty good. Not a good idea to try new restaurants on opening week.